Apple —the world's most profitable public company —is a day away from releasing its March quarter earnings. That means that while the company itself is in an official quiet period, everyone else is free to publish false and misleading information about it. Let's take a look at some of the worst fallacies. Reports on the state of Apple's conventional computing platform often obscure the fact that Mac market share has incrementally continued to grow while sales volumes in the PC industry-at-large continue to rapidly shrink (by 9.6 or 11.5 percent over the past quarter, depending on whether you look at numbers from Gartner or IDC). That's the largest year-over-year decline in the history of the PC industry. And yet Apple is now selling more Macs than it ever has, despite the fact that it has also been selling iPads over the last five years as a direct alternative to conventional PCs. Apple isn't just out-swimming its PC peers; it now has two computing platforms (Macs and iPads) that are each roughly equivalent to HP's consumer PC business, while also being far more profitable (with profit margins about ten times higher). It's noteworthy too that the worst-performing segment in PCs is the "other" category of vendors outside the top five name brands. We've been repeatedly told that "others" were producing the cheap commodity white box bargain PCs that consumers and businesses want, but according to Gartner and IDC, those "other" PC sales are shrinking the fastest--by 18.4 or 19.8 percent (again depending on the market estimator). Clearly that commodity story wasn't true. Apple builds the majority of the world's premium-priced PCs and pockets the lion's share of profits generated by conventional computer sales. On top of that, it faces very little real competition from other PC makers in the premium space. Additionally, there's some significant potential for growth among Apple's Macs as Windows--which still represents around 92 percent of PCs globally--continues to lose importance as a platform. Over the last year, companies have reported major support cost savings per user by switching from Windows PCs to Macs (IBM reported saving $270 per Mac). 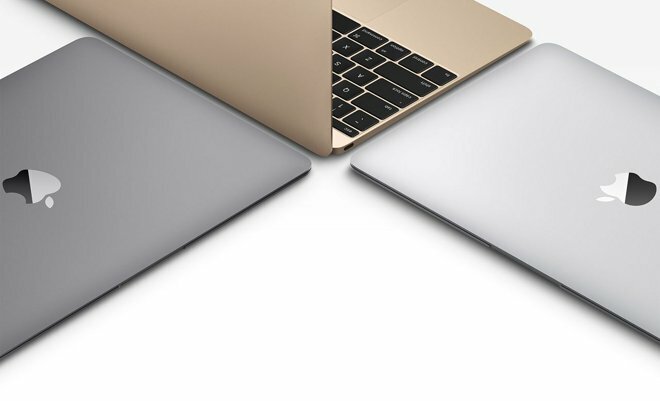 Despite the supply of ever cheaper PCs, Apple has been pushing most of its Mac offerings up market, particularly with its new Retina iMacs, MacBook Pros and the new ultralight but not bargain-priced MacBook. It's hard to imagine a greater rebuke of the "commodity always wins" theory that Windows PC advocates have been promulgating since the beginning of PCs. At the same time, Apple has not introduced any radical new product categories or show-stopping new breakthrough features in its own conventional PC space. Macs haven't even inherited hallmark iOS-related features such as Touch ID yet, instead coasting along on incremental but regular new annual OS X feature updates such as FaceTime, iMessages, Handoff and other iOS Continuity features, along with increasingly faster and more efficient hardware component upgrades. That casts doubt upon the incessant insistence of pundits that without major new and surprising product features, Apple will be unable to sell new generations of iPhones and iPads. While it's true that key differentiating features have indeed helped to sell iOS devices, it's also true that the superior experience of Macs and iOS have helped even minor refreshes to sell and reach new record numbers. The fact that Apple's Mac platform is still profitably chugging along after 30+ years, having withstood viruses and malware better than Windows while also more adeptly adapting to the emerging mobile-centric world, says something powerful about the prospects of Apple's newer iOS platform. Pundits were wrong: Apple does seem to know how to beat everyone else in the industry, and keeps doing so year after year. Jumping from Macs to iPads, many of the same themes reoccur. The commodity tablets (first running Windows, then webOS, then Android, then Chrome, and most recently Windows 10) that were supposed to beat Apple's iOS iPad have only kept manufacturers busy--but not profitable. None of those alternative OSs have built a real platform for successful tablet-optimized software. And while there is extreme scrutiny of the exact numbers of iPads Apple sells each quarter, we have no audited data on the tablet unit sales of other manufacturers, including Samsung and even Microsoft. That hasn't stopped pundits from bleating praise of the Microsoft Surface as being wildly successful, a message that is simply not true. 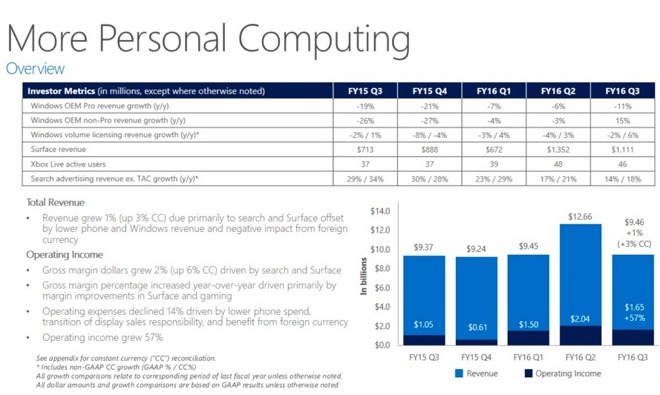 For example, Brad Jones of Digital Trends wrote that Microsoft's earnings indicated "strong Surface sales" based on a 61 percent year over year increase in Surface revenue. However, that increase is calculated in comparison with the relatively pitiful $713 million in revenue Surface earned in the year-ago quarter, on sales of less than 1 million units. Increasing that to $1.65 billion for the current quarter results in a quarterly unit figure that's somewhere south of 1.5 million units. That's not "strong;" it's inline with the Zune. The floral language used to beatify the Microsoft Surface as supposedly being wildly successful (despite actually being a drop in the bucket of PC sales after three years of absolute failure) is curiously not also used for new product introductions like Apple Watch, which appears to have shipped about twice as many units as the Surface despite being an entirely new product category. Apple Watch is a fashion accessory, while Surface is essentially a PC alternative that runs conventional Windows software. Surface should be much easier to flog than a relatively expensive and not particularly business-essential watch. Why is the first generation Apple Watch trouncing Surface in volume sales in Microsoft's fourth year of trying to sell an iPad-like PC? Over the December quarter, Apple's introduction of the brand new 12.9 inch iPad Pro outsold the entire Surface line by itself. 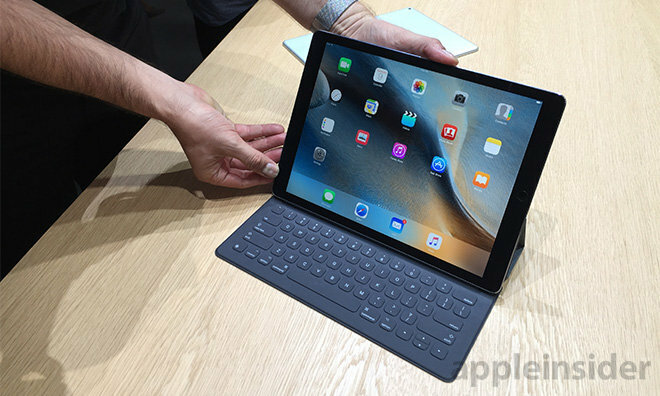 A quarter later, Apple began selling an even less expensive, smaller 7.9 inch iPad Pro. We won't see Apple's numbers for March quarter iPad sales until Tuesday, but we do know that Microsoft's Surface sales have subsided by nearly 18 percent quarter-over-quarter (via the company's reported results last week). Imagine how many pundits would be patting Apple on the back if it were to report an 18 percent decline in iPad revenue for the quarter! The drop-off in Surface sales since the holiday quarter also indicates that Surface is much more of a cyclical, holiday niche product that only satisfies a very small minority of the PC audience, rather than being a substantial anchor for Windows 10 as a platform, or potentially offering any hope for Microsoft's stated goal of selling significant volumes of hardware devices. Outside of Microsoft's Surface, there's little indication of any other real competitor to iPads outside of Google's Chrome netbooks that the search giant has been dumping on education users as a loss leader while vainly hoping that enterprise users would notice or care. (They haven't.) There's also no shortage of Android tablets to choose from, but that isn't resulting in businesses choosing them, either. As with conventional PCs, the same low end, "white box" commodity tablets and cheap devices being sold by vendors such as HP have not proven successful or sustainable. HP backed out of the cheap Android tablet business last quarter. In start contrast, iPad and its iOS platform has been cementing a strong lead in the Enterprise, taking particular advantage of the trend toward mobility. With Enterprise partners including IBM, Box and Cisco, Apple's iPad is best positioned as the tablet platform to take over share from the conventional Windows PC going forward. While supply chain rumors first predicted a year-over-year decrease in iPhone sales last quarter (which turned out to be wrong), even Apple projected that it would sell fewer iPhones in the March quarter than it did last year. 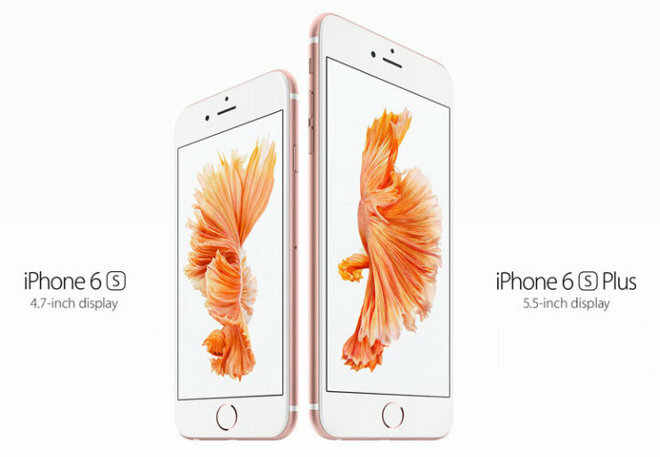 However, that's also in keeping with the fact that Apple ramped up supplies of iPhone 6s faster this year than last, and that iPhone 6 sales were so incredibly high last year due to pent up demand that beating those numbers with an "s" model refresh was assumed to be unlikely. This is a pattern that has played out before. There is no indication that smartphones are going away the way that PCs are, or the way that tablets have plateaued. And despite the availability of many Android models at lower price tiers, Apple hasn't really seen defection away from its $650+ iPhones to Android. On the other hand, a large number of new iPhone buyers are coming from Android. This is more evidence that the smartphone "cheap commodity" model which perpetually predicts eventual doom for Apple is seriously flawed, just as it has proven to be with PCs and tablets. As was the case with early iPods, there are buyers who are willing to pay less for lower priced competitive devices. However, any time there are enough buyers to warrant targeting with a less expensive model, Apple has quite decisively and successfully won them over. That happened with the iPod mini, nano and shuffle, again with the iPad mini, and most recently with the refreshed iPhone SE, which targets both the market for smaller phones and for a lower-priced iPhone. Even if the market for luxury-priced $600+ iPhones does peak at current volumes, Apple has lots of similar potential for addressing new emerging markets with lower-end or second hand iPhones going forward. Apple hasn't ever published quarterly sales figures for Apple TV or Apple Watch, making it harder for competitors to understand the potential value of copying the company's work. That also makes it harder for the market to value the potential of Apple's iOS outside of tablets and phones. 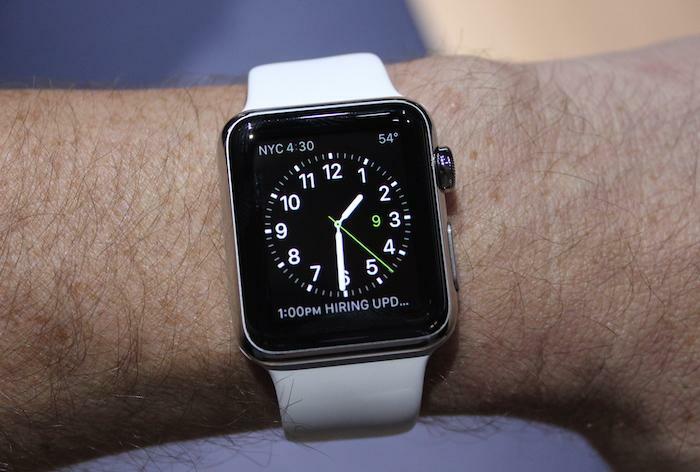 However, we do know that Apple Watch is by far the most commercially successful wearable, and that it's having a significant impact on mechanical watch demand. Apple TV is also a strong player in set top box and media sales and rentals, and holds the potential for launching new subscription services in parallel with the quite successful Apple Music, resulting in new streams of reoccurring revenue. Both devices also help to increase the stickiness of Apple's iOS platform, particularly with their integration in Health and HomeKit devices, and with related services including the aforementioned Apple Music, other iTunes media sales, iCloud storage and Apple Pay. These Services-related income sources all contribute new revenue from the existing billion-device installed base of iOS. When you look at the euphoria and hope surrounding the prospects of Facebook, YouTube and Snapchat to generate tiny sums of ad revenue multiplied by a billion users, it's simply curious that there isn't similar attention being given to Apple's potential for growing and expanding upon its paid offerings for its intensely loyal and massively large, global user base. That's a subject that's likely to get primary attention during Apple's earnings call on Tuesday.